When I was teaching at South Vo-Tech High School in Pittsburgh, Pennsylvania (for our international friends, that is west of the state of New York), we introduced a new Laboratory. My Biology students enjoyed this Lab each Friday. What Lab? I called it ‘Slide lab.’ Some 80% of my students were from low-income city neighborhoods. When I met them each September, they (97% of them) could not name or recognize a single local bird (robin, house sparrow, crow, blue jay) or butterfly. They were children of brick, asphalt and concrete. This struck me as sadder than dirt! I love to photograph wildlife. They were studying Biology. Thanks to my background (the streets of Brooklyn, National Guard Artillery, OCS and years as a Dean (Discipline) in a NYCity high school) we were getting alot done, and they were enjoying it. Honest. So I invented Slide lab. If you have taught for a living, you will not be surprised to learn that school administrators were not happy about this Slide lab. It didn’t matter that the kids were learning about their own communities. This initiative did not come down from the top. Cut! When June arrived, my students identified many, many local birds, butterflies, insects and wildflowers by name. This made me happy and satisfied. When my wife Frieda was spending so much time in Shadyside Hospital, I would occasionally encounter some of these students. Almost none of them went on to university, but there they were as custodial, techs and nurse assistants. They would see me: up comes a big smile, and then “Mr. Zablow?” Then, they would proudly rattle off the names of our local fauna & flora. Me? My heart, broken upstairs on that sad, sad 7W stem cell transplant wing, would suddenly Surge with HAPPINESS. Grown now, these men and woman were surely introducing their own children to the now familiar wildlife living right next door to them. City parks and empty lots no longer remained invisible. Now to this Epargyreus clarus. 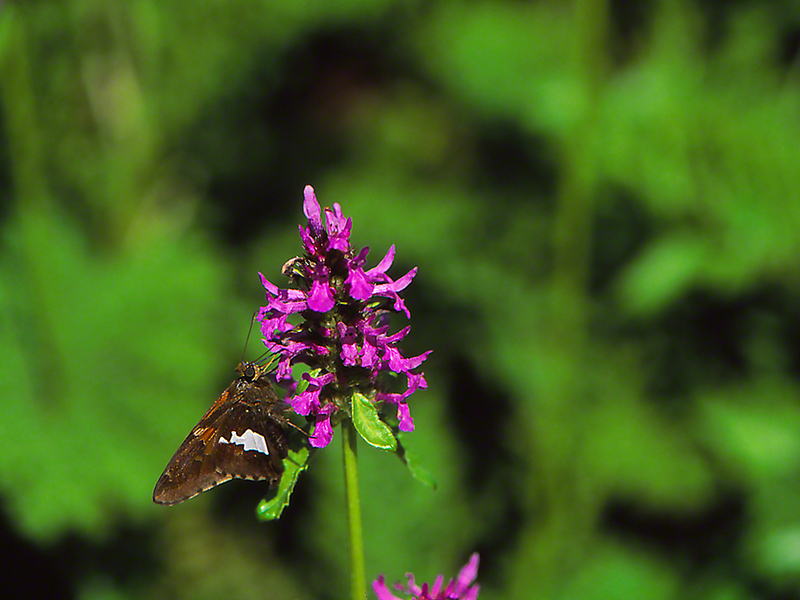 That silver patch set in a field of dark brown enables all of us to recognize this butterfly immediately. They were ideal for my kids. Ideal. They saw them in their neighborhoods, They saw them in their playgrounds and they saw them as they walked home from the bus stop each afternoon. They averted their eyes from the many disappointing sights that summed up their surroundings. But they looked for and saw Silver-spotted skippers, and Cabbage whites and Orange sulphurs and searched, searched those empty lots for the elusive Monarch or Red Admiral. Slide Lab? What happened to Slide Lab?